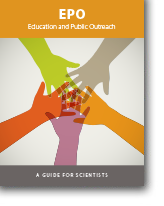 This guide provides basic information for scientists who wish to engage in education and public outreach (EPO) activities. Engaging in EPO can be an excellent way to address funding agencies’ requirements that proponents articulate the broader societal value of their research. Whether or not you happen to be preparing a proposal, this guide can help you recognize and contribute to high-quality EPO. In this guide, EPO refers broadly to efforts to increase awareness and understanding of science. Audiences targeted can include students, teachers, children, adults, and just about any conceivable subset of these (e.g., economically disadvantaged youth, adult education instructors, museum visitors, parents, newspaper readers, high school students). We broadly define informal education as lifelong learning in science, technology, engineering, and mathematics (STEM) that takes place across a multitude of designed settings and experiences outside the formal classroom (see the Center for Advancement of Informal Science Education website at http://informalscience.org). The guide reflects our experiences in ocean sciences EPO, however, the strategies presented are readily applicable to scientists in other disciplines. Please send your comments on this booklet, along with corrections, to magazine@tos.org. We will update the booklet periodically based on community input.